Quick… Think of your favorite fall foods. If you are like me, you said apples and pumpkins. I did a roundup of some favorite fall recipes from other bloggers, and guess what? Most of them were apple and pumpkin too! Here are some you may like to try. Pumpkin Cookie Frosting – Let’s start with dessert. These pumpkin cookies with vanilla-cinnamon cream cheese frosting on Pinning Everyday make my mouth water just looking at them! There is a recipe for both the cookies and the frosting – I bet the frosting would be amazing on carrot cake too! Pumpkin Pie Stuffed French Toast from The Grant Life. Is it breakfast or dessert? I’m not sure but I can’t wait to try it! Also from The Grant Life, Pumpkin Scones. You can use either a plain powdered sugar glaze or a spiced glaze with this one – both recipes are included. The Pumpkin Muffins from Finding Beautiful look pretty simple and delicious! There are a few stir-in ideas as well, like chocolate chips, cranberries, and walnuts. How about this Sauteed Apple and Cranberry Oatmeal to warm bellies on cool mornings? Easy morning recipe that will make you a hit in your house. Baked Apples anyone? These baked apples on Saved By Grace Blog remind me of when I was a kid. Yummy! I can almost smell them through the screen. Saved By Grace Blog also has a recipe for Ultimate Apple Cider – served in an apple! How cute is that? Mommy Musings has a phenomenal recipe on her blog for Caramel Apple Pork Chops. I want to lick the computer right now! Pork chops and apple sauce is a match made in heaven. Imagine how much better they are with caramel? Looks like a family favorite just got better! Mommy Musings isn’t just skilled with the pumpkin recipes – here she has a quick and simple recipe for Mini Apple Dumplings. Even better, they’re made with crescent rolls! These look like they may even be something the kids can help you with. Thank you to all the bloggers who participated in the roundup! 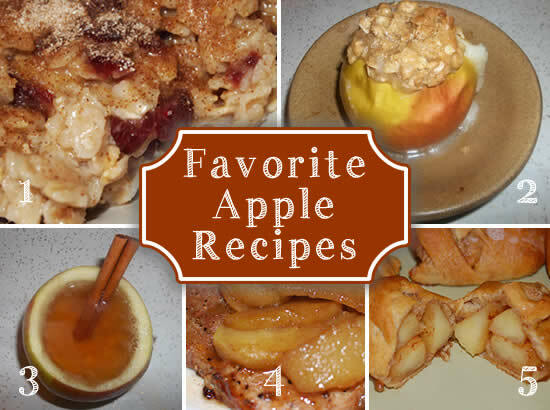 These are just a few of many, many delicious apple and pumpkin recipes out there. I can’t wait to go grocery shopping this week for the ingredients. Try them with me and let me know which ones are your favorites! What are your favorite fall food recipes? 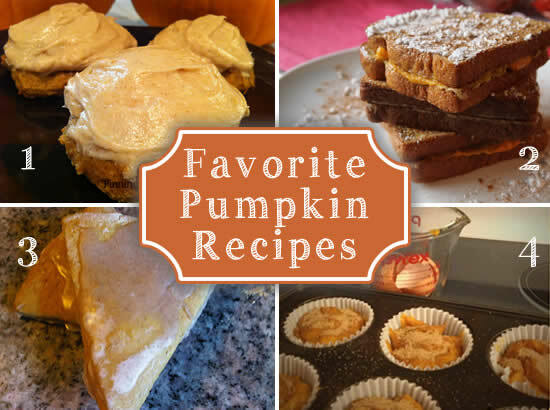 Thanks for featuring my pumpkin and apple recipes Stacey! Everything looks great! Thanks for including two of my recipes! I can't wait to get going on them again this autumn! That french toast looks amazing! Pinning this post STAT!